This 6" x 6" ALL GENDER Sign shows that the restroom is available for anyone, regardless of gender. 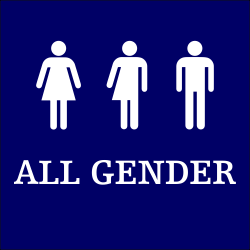 Let your customers know that your restroom is available for all genders with this 6" x 6" ALL GENDER sign. This sign comes in a variety of colors with an option to add braille in compliance with the American Disabilities Act. Corner and mounting options are also available.